Today, the Ado Ekiti, the capital city of Ekiti State would pulsate with the throng of political heavy weights, men of timber and caterpillar. It is a day for the ruling All Progressives Congress (APC) to intimate (intimidate?) the people of Ekiti with what it takes to be in control of the federal government in Nigeria. Were it to be in a military regime, today should be appropriately styled as Operation Federal Might! All the governors elected on the platform of APC, the party’s national leadership, financiers, ministers and the President, Muhammadu Buhari, are expected to address a mammoth crowd of Ekiti people, including those eager to come and see in real lives the movers and shakers of Nigeria. Although President Buhari is being hyped as one of the dignitaries that would make a last pitch effort to market Dr. Olukayode John Fayemi to voters, his attendance is not a certainty. 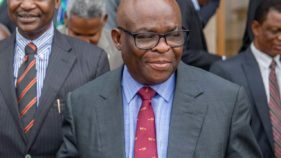 Last Thursday, the former federal ruling party, Peoples Democratic Party (PDP) held its own mega rally to drum support for its governorship candidate for the election coming up on Saturday.In his address at the occasion, the outgoing governor and landlord of Ekiti, Ayodele Fayose, said he wont welcome Buhari and his delegates to the state, pointing out that he sees no reason to honour the President with such courtesy when he (Buhari) did not deem it fit to construct even a 100-kilometre of road in Ekiti. Fayose, who is also the chairman of PDP Governors’ Forum, attracted some heavy weights from his party, including former Vice President, Atiku Abubakar; National Chairman of the Party, Uche Secondus; former Chairman of PDP, Ahmed Makarfi; former governor of Jigawa State, Sule Lamido, former Sokoto State governor, Alhaji Attahiru Bafarawa. Incumbent governors of PDP states, including Ben Ayade, David Umahi, Okezie Ikpeazu, Ifeanyi Okowa, Darius Ishaku, Nyesom Wike, Ibrahim Dankwambo, Seriake Henry Dickson, Emmanuel Udom and Senator Duro Faseyi, were also in attendance to show their solidarity. 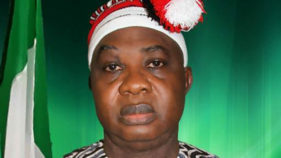 The icing on the cake was the chairman of Accord Party, Ekiti State, Chief Samuel. Should President Buhari attend the rally for his erstwhile Minister of Solid Minerals, it would not only be in defiance to Fayose’s lack of subtlety, but also an endorsement of the fact that he places politics above policy, which concerns deliverables of governance. The APC rally in Ado Ekiti, with the President in attendance would also drive home other salient issues about the governorship election in the state. A lot of commentators have noted with dismay that exchanges of accusations and counter-accusation by the two major political parties tended to define the governorship. Which ought not to be.Ekiti is a relatively small state in the Southwest, which is controlled by the opposition PDP. The strategic position of the state in the calculations for the 2019 general election has also made it a reference point in many ways. The last Ekiti State governorship election held four years ago in 2014, that is, a year to the 2015 general election and despite the national campaign of calumny against the incumbent President, Dr. Goodluck Jonathan, who was seeking a second term in office, his party, PDP clinched the governorship seat, defeating an incumbent, who was seeking a second term. President Buhari is seeking a second term against adverse public opinion regarding his handling of the economy, national security and internal politics of his party. His presence in Ekiti today would underscore the point that he is desperate to win the state as a demonstration of the popularity of APC and by extension, his ambition. It would also feed the narrative that the President has treated the Southwest unfairly, especially against the background that the zone swelled the votes that gave him the winning edge over PDP in 2015, by not caring to visit the zone, except for partisan considerations. Recall that on two occasions, shortly after his inauguration, the President scheduled visit to Lagos were aborted, first for tympanic challenges and secondly for security concerns. But he was in Ondo for a political rally, after former Lagos State governor, Bola Tinubu was shunted aside from pre-eminent position as APC’s political godfather in the Southwest. And coming at such a time when Nigerians are in sad and mournful mood over the unconscionable massacre of innocent civilians in Plateau and Zamfara States, it would be interesting to watch the nation’s chief security officer mount the soap box for a governorship contest. 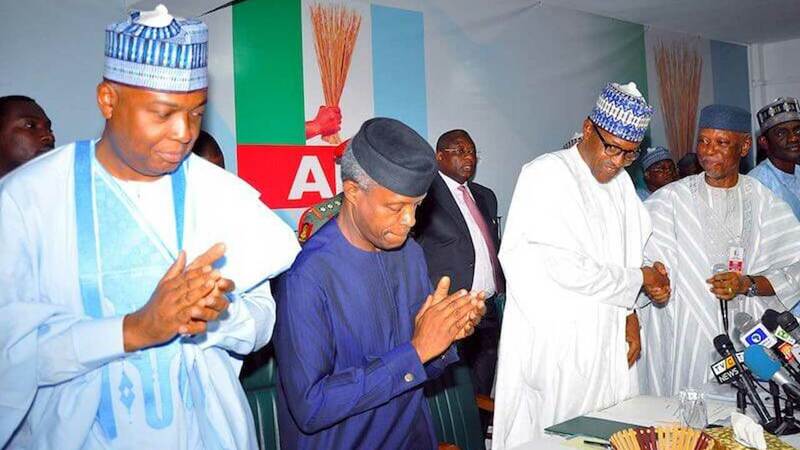 It is possible that the opposition PDP might cash in on the rally to remind the President of what Nero did while Roman burnt.Yet, if he stays away and sends the Vice President, Prof. Yemi Osinbajo, the President must have provided a big letdown for the APC governorship flag bearer, Fayemi, who was not only a member of the cabinet, but also a resourceful member of the President’s wider kitchen cabinet. Perhaps on account of emphases on its 2019 implications and two-way dimensional duel, the 2018 Ekiti governorship does not measure up as other recent governorship polls, especially Edo and Anambra, where televised debates among the gladiators were held. Although Governor Fayose would not be directly on the ballot on Saturday, his preference for his deputy, Prof. Kolapo Olusola Eleke, to succeed him conferred a vicarious responsibility on him (Fayose) and PDP.To that extent, the governorship poll becomes more like a referendum on Fayose’s and Fayemi’s tenures. Speaking during the PDP rally, former Vice President Atiku Abubakar, recalled that he had known Ekiti since 1992, stressing that whatever infrastructure project on the ground in the state was done by PDP. 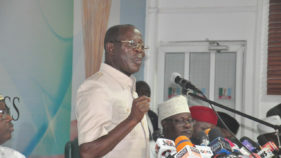 Although Fayemi did just a term of four years, he would point to his attempt at improving the superstructure in the state, particularly impetus for qualitative education and incentive to teachers.But, instead of placing the performances of the outgoing governor and the candidate of APC, the contest became jumbled by the invasive posture of the federal forces in a bid to clear the coast for 2019. NOT much has been reported about the demographic considerations that defined the emergence of candidates of PDP and APC. For instance, although both primary elections were subject of grumbling by aspirants that lost out, PDP seems to have responded to zoning and youth participation. Prof. Eleka is from Ekiti South Senatorial district while his running mate is from Ekiti Central. Fayose from Ekiti North selected his running mate from Ekiti Central. At todays rally, it would be seen whether the APC would dismiss the people’s sensibilities to zoning on the altar of integrity and attraction of goodies from the Federal Government. No doubt, generous mention would be made of the Federal Government’s N-Power programme and the fight against corruption. But the real measurement or even metrics involved in the Ekiti governorship poll would emerge after electioneering ceases on Thursday, July 12, 2018. Today’s rally by APC would among other revelations, give clear indications about the theme and tenor of the party as it prepares for a major election after its surprise routing of PDP in 2015. But, Nigerians pray that the verdict of voters should be final. As such, remarks by various speakers at the rally will expose the temperament of the ruling party, whether it believes in federal might or democratic right.